Ho Ho Ho Video Slot Guide & Review - Casino Answers! 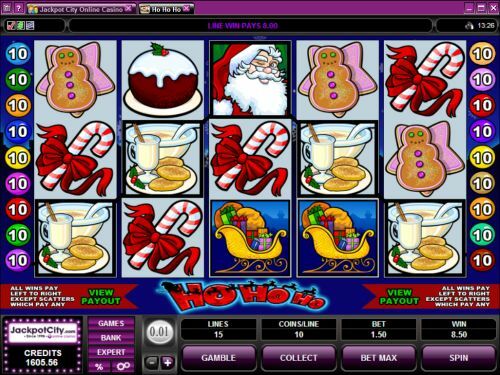 Ho Ho Ho is a 5-reel, 15-line video slot developed by Microgaming, featuring wild symbol, scatter wins, multipliers, a free spins feature and a gamble feature. You can play the Ho Ho Ho video slot at Bovada. Coin sizes on the Ho Ho Ho slot machine are $0.01, $0.02, $0.05, $0.10, $0.20, $0.25 and $0.50. You can select 1-15 paylines and from 1-10 coins per line. You can bet anywhere from a penny per spin up to the maximum total bet of $75. Ho Ho Ho has a good betting range that is suited for both casual players and high rollers. 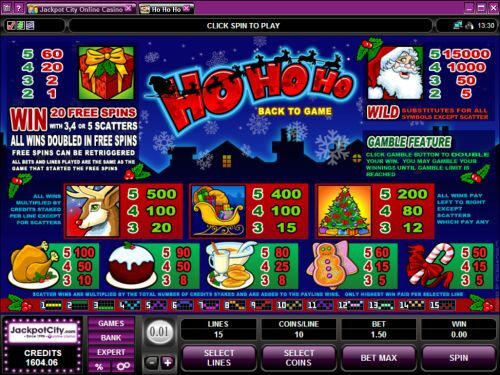 You can play the Ho Ho Ho online slot game by selecting your bet and hitting the “Spin” button or to play all 15 lines with 10 coins enabled, hit the “Bet Max” button. The highest paying symbol on Ho Ho Ho is the Santa Claus symbol. If you hit 5 Santa Claus symbols on a selected payline, you will win the 15,000 coin top jackpot. The Santa symbol is wild and will substitute for all symbols except for the scatter symbol. Hit this jackpot and you will win enough cash for a very Merry Christmas at Bovada! Ho Ho Ho’s scatter symbol is the Present symbol. 2, 3, 4 or 5 Scattered Present symbols will pay out 1X, 2X, 20X or 60X your total bet. 3 or more Scattered Presents will win you 20 free spins with a 2X multiplier. All wins are doubled during the free spins feature. The free spins feature can be re-triggered. All bets and lines played are the same as the game that triggered the free spins feature. Whenever you win on the Ho Ho Ho slot game, you can hit the “Gamble” button to activate the gamble feature. In the gamble feature, you must predict whether the facedown card will be Red or Black. If you are correct, you will double your winnings. If you are incorrect, you will lose your winnings. You can exit the gamble feature at any time by using the “Collect” button. To use Ho Ho Ho’s autoplay mode, you must hit the “Expert” button. You can now play 5 or 10 autoplay spins. For advanced settings, hit the “AutoPlay” button and you can now play 5, 10, 25, 50, 100, 250 or 500 autoplay spins and stop autoplay if a win exceeds or equals $100, $500, $1000, $5000 or $999. Autoplay will stop on any feature contained in the game. You can stop autoplay at any time. Ho Ho Ho is a very solid X-Mas themed video slot. Its highlights are an excellent top jackpot and a free spins feature. The presentation is good, but by today’s standards, it could be a lot better. It’s still a very good video slot that you will enjoy especially if you are in a festive mood during the holiday season. To play the Ho Ho Ho video slot, you can sign up and make a real money deposit at Bovada! Are players based in the USA able to play the Ho Ho Ho X-Mas slot for real money? Unfortunately, American players cannot play the Ho Ho Ho online slot for real money at this time. If you are located in the United States and would like to play a Christmas slot game, we recommend Bovada, where you can find many different Christmas slots for players in the United States to play. Can I play a free Flash game of the Ho Ho Ho slot machine? Yes, there is a Flash game of the Ho Ho Ho video slot at the Instant Play casinos located at Bovada. You may play for free in practice mode or for real money. If you come across any issues with the Instant Play casino, we suggest downloading the most recent version of Adobe Flash Player. Where can I play more Christmas slot machines? You can read more X-Mas slot reviews by checking out our list of X-Mas themed slots.